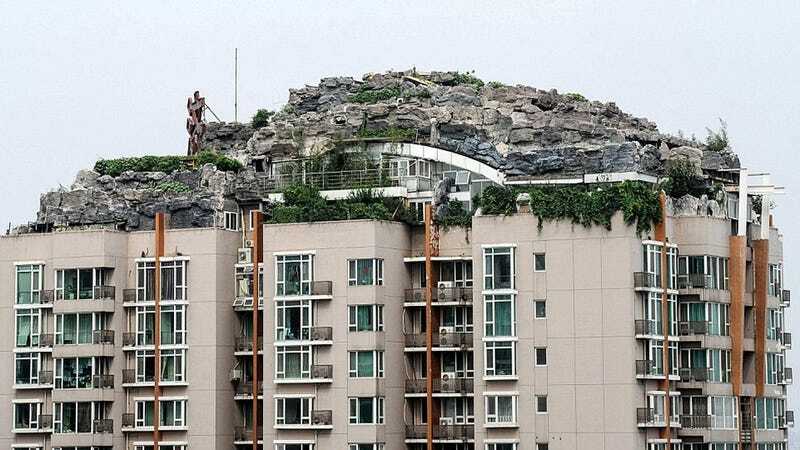 In case you had dreams of one day building a giant stone fortress atop a towering apartment building without asking anybody's permission or attempting to get the proper permits, let this be a warning to you: eventually, someone's going to ask you to tear it down. That's what's happening to Zhang Lin, a wealthy professor who made a fortune in medicine and then spent six years turning the top floor of his apartment building into an illegal stone Shangri-La. Before starting such an audacious and expensive project most people would look into the proper permits, and even conduct feasibility studies to make sure the building could support such a structure. But not Lin. He just started building, slowly bringing up the materials and supplies needed to construct the rooftop palace, including additional metal supports so that it didn't collapse into the floors below. Unsurprisingly, cracks in the building's structure are starting to show, and the addition has resulted in broken pipes that lead to constant flooding for the residents below. Until recently, Lin hasn't seemed too concerned with their plight, throwing loud parties and doing whatever he wants, but now his neighbors have made formal complaints to the government, and given the publicity this monstrosity has generated, he's probably got some 'splainin' to do.